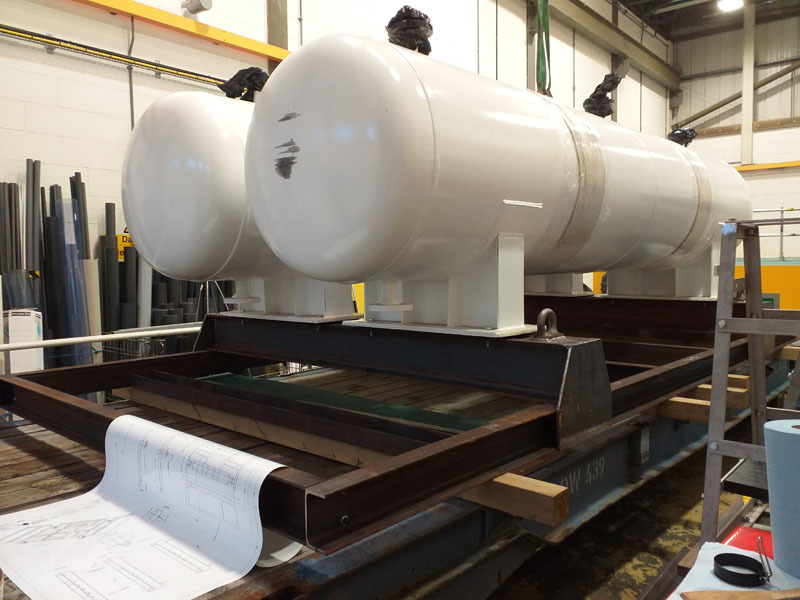 The CO2 tanks that will form part of the gas delivery system for the controlled release experiment have now arrived at the National Oceanography Centre (NOC) in Southampton ready to be built into the large steel deployment frame being fabricated on site. The two tanks (pictured below in the workshop at NOC) have a capacity of 2.8 m3 each and a max working pressure of 80 bar. In total they will contain 3 tonnes of liquid CO2. The deployment frame that will be placed on the seabed will incorporate the CO2 gas tanks as well as the bladder accumulators that are being used for the tracer gases. The gas control unit that will control the mixing and flow of the gases will also be built into the frame along with the reels for the hose that will connect to the buried pipe placed under the seabed for the release of the CO2. The gas control unit contains filters, pressure and temperature sensors, a non-return valve and actuated isolation valves for remote control of the unit from the ship. © Copyright 2019 STEMM-CCS has received funding from the European Union’s Horizon 2020 research and innovation programme under grant agreement No. 654462. All rights reserved.